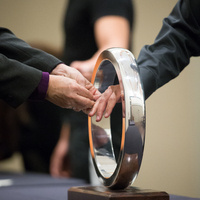 Each year, the School of Engineering and Computer Science hosts the Pledge of Professionalism, symbolizing graduating seniors' transition from student life to professional life. Engineering students participate in the "Order of the Engineer" ceremony, fostering unity of purpose and pledging to uphold the standards and dignity of the engineering profession and to serve humanity by making the best use of Earth’s precious wealth. Each student who accepts the Obligation of the Engineer is given a stainless steel ring and a certificate. Computer Science students participate in the "Pledge of the Computing Professional" ceremony, pledging to promote and recognize the ethical and moral behavior of graduates of computing-related degree programs as they transition into careers of service to society. Each Computing Professional inductee is given a pin and a certificate. This event is extended to graduating seniors in the School of Engineering and Computer Science, their families, and any industry professionals that would like to attend. View this video from last year's Pledge of Professionalism Ceremony.